If one asks, when have we traveled half the flight time to reach Pluto? That halfway milestone occurs on October 17, 2010. But if one asks, when will we be half as far from the Sun as Pluto will be at the time of our encounter on July 14, 2015? That occurs somewhat earlier, on April 20, 2010. And if one asks, when will we have traveled half the heliocentric distance to Pluto from our launch at Earth? That milestone occurs even earlier, on February 25, 2010. So, as you can see, the answer to the halfway question depends on precisely what it means to be halfway. In fact, you could even ask when the halfway day was from New Horizons project inception on December 20, 2000, to Pluto arrival on July 14, 2015 — that was April 4, 2008. Or one could ask about the halfway day from when we began our push for a Pluto mission on May 4, 1989 (when we had our first meeting with NASA officials) until Pluto encounter — that was on June 9, 2002. So in some ways we’re already halfway there, and in other ways, we have well over a year to go to reach the halfway point. Our goal — closest approach to the Pluto system — will occur on July 14, 2015. 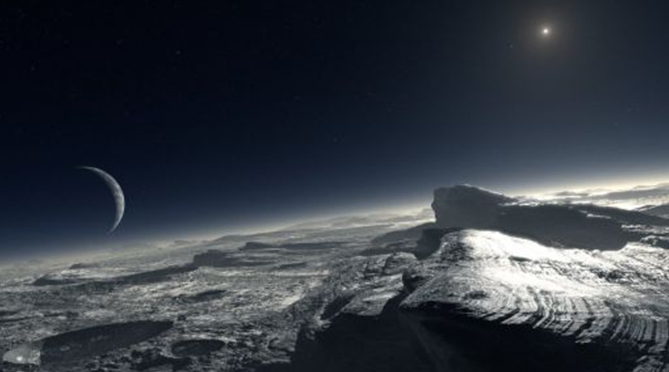 This is an enchanting new artist’s conception of Pluto’s frosty surface, with Charon in the background. (ESO/L. Calçada) But regardless of which halfway milestone you like, we still have a great deal of work ahead of us and a long time to steward our craft across the great gulf of space to the Kuiper Belt, and we’re looking forward to that. Since I wrote in early January, New Horizons has remained in hibernation, reporting on its health once or twice a week. 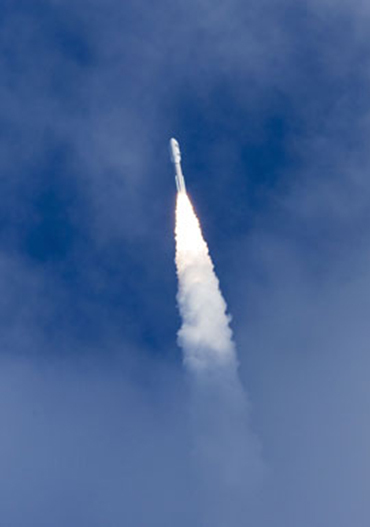 New Horizons continues to do very well in flight. We’re almost 100 days into our current hibernation period, and besides taking care of itself autonomously, New Horizons is collecting data with the Venetia Burney Student Dust Counter. During those 11 weeks, New Horizons traveled out about another 70 million miles (112 million kilometers), and we’re just three weeks from reaching 13 astronomical units from the Sun. It’s hard to believe how far we are from anything else created by humankind. Except for our own, now-derelict third stage, nothing made by people or from the Earth — nothing — is within more than a billion miles of New Horizons. Back on the ground, we’re just beginning to plan for this year’s annual wakeup from hibernation, which will begin on July 7 and last several weeks. This year’s wakeup is different from our previous ones in two significant respects. The first difference is that we’ll be conducting the checkout in the summer rather than the fall. Summer checkouts will be our norm from here out, allowing us to get into the rhythm of spring planning and summer activity that is necessary for the July 2015 encounter. The second and even more significant difference between past wakeups and this one is that we’re going to minimize the activities to save time for our mission planners, who are busy writing Pluto encounter close-approach sequences with a deadline of 2010. The minimal wakeup for 2009 also saves us fuel, since we won’t be de-spinning the spacecraft, conducting complex pointed observations with our scientific instruments, and then spinning up again to prepare for the next hibernation cycle. Although we plan more active wakeups that involve de-spinning and conducting many pointed observations in 2010, 2011, 2013 and 2014, 2012’s checkout will be another minimal one, again saving us labor and fuel. That catches you up on where we are in our flight plan, but there’s one more thing I want to write about. When New Horizons arrives in 2015, we will learn a great deal about Pluto’s atmosphere. But for now, Earth-based studies are our only way of making advances. Early last month, scientists published an exciting new scientific result about Pluto’s atmosphere. 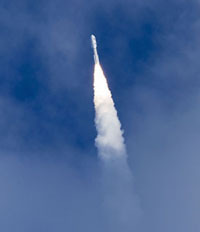 Using spectra obtained during an August 2008 event when Pluto occulted a star in the sky over South America, a European team led by Emmanuel Lellouch learned that Pluto’s atmospheric methane (CH4) abundance is now about 0.5 percent, somewhat less than previous measurements over a decade ago. (Methane gas was discovered in Pluto’s atmosphere in the 1990s by New Horizons Co-investigator Leslie Young and mission collaborator Jim Elliot.) Why the CH4 abundance is decreasing isn’t known, but it might be related to the onset of atmospheric and surface cooling as Pluto draws away from the Sun. Lellouch and company also found that Pluto’s surface pressure is between about 7 and 24 microbars. A microbar is one one-millionth of an Earth atmospheric pressure, so Pluto’s surface pressure is between 1/300th and 1/1000th as on Mars’s surface. Lellouch and his coworkers also found that Pluto’s diameter must be 2,340 kilometers or larger — so previous estimates of 2,300 kilometers or less have now been ruled out — another cool result. Congratulations to Emmanuel and his research team for these exciting new insights into a fascinating planet out on the frontier of the planetary system. Well, that’s it for now. I'll be back in touch just before we begin checkout in July. In the meantime, keep on exploring, just as we do!